At RICHARDSON EYE ASSOCIATES we provide comprehensive, primary eye care for the whole family. This includes prescribing glasses, contact lenses, or medications as needed. Regular eye examinations are important to maintaining good eye health and preserving your eyesight for your entire life. All too often, sight-threatening and even life-threatening eye diseases do not have obvious signs or symptoms to make you aware of their presence. Regular eye examinations may be the only way to uncover them. By diagnosing eye and vision conditions early on, we are able to provide treatment options and, in many cases, restore vision or prevent vision loss. For most patients, a yearly eye examination is sufficient, but depending on your personal and family medical history, you may need to be seen more often. This is where every good evaluation of your eye health and vision gets started. This is your reason for the visit ... why you are here. Reasons can be as simple as "I'm not having any problems, it's just time for my yearly eye exam", all the way to "I feel like I'm losing my vision and I'm really scared ..." You will be asked questions about the problems or concerns you have as these questions help the doctor determine if any special testing is needed in addition to the common elements of a comprehensive examination, so please be thorough in telling the doctor everything that is on your mind. This will ensure you will leave the office after your examination confident that your conditions and concerns have been thoroughly addressed. During the eye examination you will be asked to provide information about your personal and family health histories. Your eyes are an extension of your brain, and they are affected by every aspect of your personal health and lifestyle. Your daily work and home environments, what you eat and your sleep habits all contribute to your eye as well as your overall health. Smoking, drinking caffeine and alcohol, diet, exercise, stress levels and any medications that your are taking also influence your eye health and vision. In addition, your family history will alert the doctor to specific eye problems for which you may be genetically at risk. Preliminary testing includes checking your vision with and without correction, color vision, stereopsis (depth perception), eye muscle capabilities, eye alignment, convergence (ability to turn eyes inward), peripheral vision, pupillary distance (distance between the eyes), and pupil responses. Automated instruments are used to measure the shape of the cornea (front lens of the eye), and provide an objective approximation of your refractive error (lens prescription). 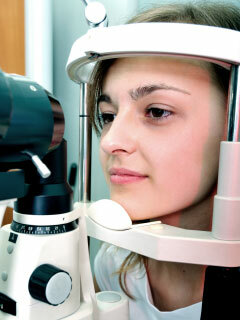 The most important part of any eye examination is assessing the medical health of your eyes. Sight-threatening and even life-threatening eye diseases often do not manifest with blurred vision, so a medical assessment of your eye health is imperative to rule out such serious problems. This evaluation is done with the aid of sophistocated instrumentation that can uncover a myriad of different disease processes, dystrophies and degenerative disorders. A biomicroscope allows the doctor to look at the anterior most structures of the eye like the cornea, conjunctiva, sclera, iris and lens with high magnification. An ophthalmoscope allows the doctor to look at the interior structures of the eye like the vitreous, retina, macula and optic nerve. A tonometer measures the pressure of the water that inflates the eye, and the Optomap provides a high-resolution digital image of the sensitive structures of the eye that can be used as reference in future examinations to detect subtle changes. Eye drops are another tool that the doctor may use during the examination to aid in the diagnosis of certain diseases. Most people have heard of disorders like cataracts, glaucoma and macular degeneration, but these are only a few of the problems that require early detection and treatment to prevent vision loss, and a thorough eye examination is the only way to uncover them. The refraction is the part of the eye examination where the doctor checks to see if you are in need of an optical prescription like glasses or contact lenses to correct your vision. An computerized instrument called an autorefractor gives the doctor an objective estimation of your prescription, while a phoropter contains many lenses that the doctor can manipulate while asking for your subjective response as to "which is better". At the end of this process, the doctor is able to prescribe a highly refined optical correction to allow you to see as clearly as is possible for you. At the end of the examination, the doctor will spend as much time as is needed to adequately review the test results with you, explain what they mean, determine a course of action, and answer any questions that you might have about the diagnosis or treatment plan. The best patients are those that understand the 'whys' and 'hows' of treatment plans, because they are more inclined to follow the recommendations of the doctor and thereby obtain the most benefit from conforming to the treatment prescribed.